This operator is a span of logarithmic periods. The span is a finite section taken from an infinite log-periodic series of log-cycles. To the right of the span is an infinite progression growing larger and larger, to the left of the span is an infinite regression shrinking smaller and smaller. 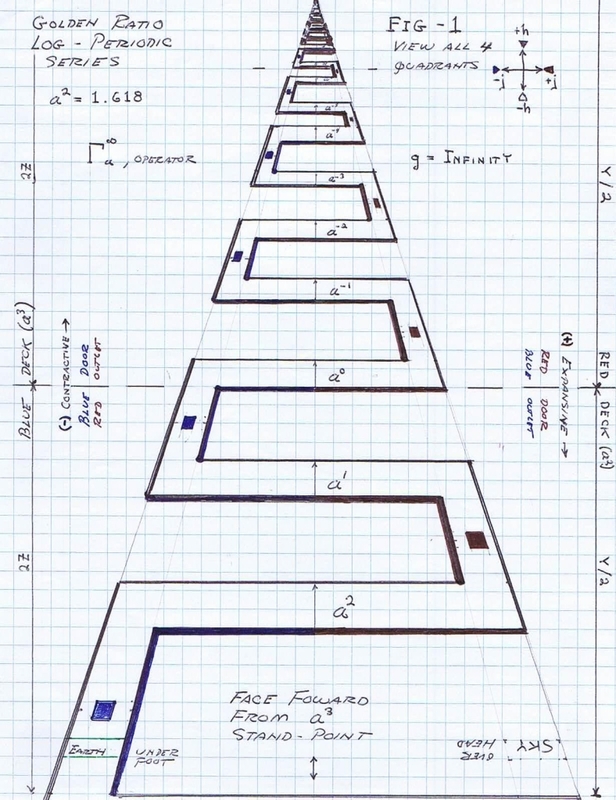 The arch-form of the log-periodic series is the broadside log-periodic array developed in the previous writings on the Bolinas Antenna, it can be seen looking at this structure the appearance of expression for infinity. This is an intrinsic characteristic of a log-periodic geometry. The log-periodic sequence is a scaling factor of proportionality and serves as an innate property of human perception, hence the “Deci-Bell”. 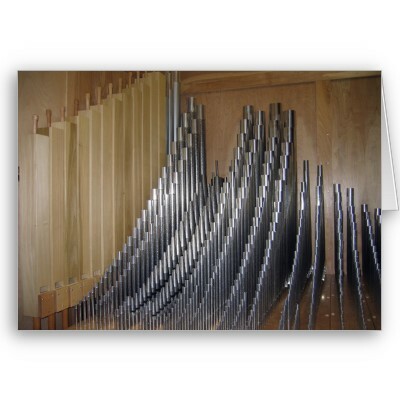 (2) The human scale factor in the dimensions of sound is a span from 32 ft to 3 inches as expressed by the pipe organ. This span represents the sequence of human versor positions in the infinite log-periodic sequence of the musical universe. 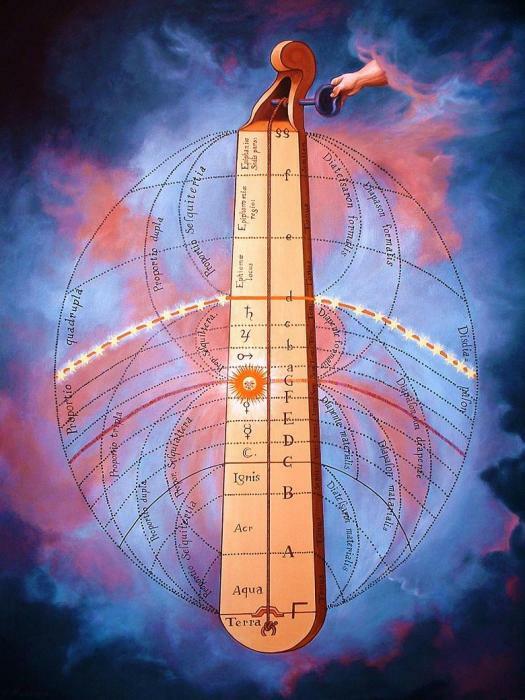 This relates directly to the original Pythagorean concept of music, the expression of man’s POSITION in the cosmos. 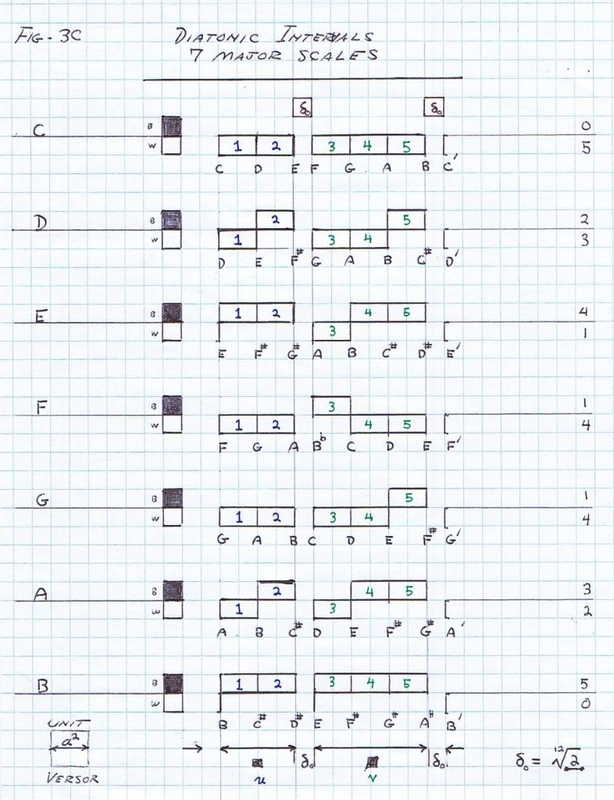 (3) The span of keys on the standard music keyboard is a log-periodic sequence. 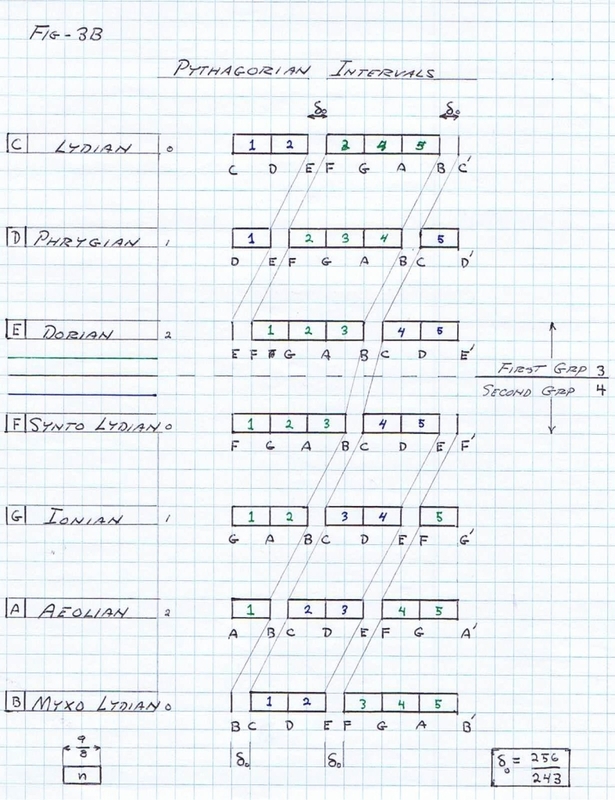 There are 88 individual keys or “notes” these representing unit versor positions of the various musical scales. 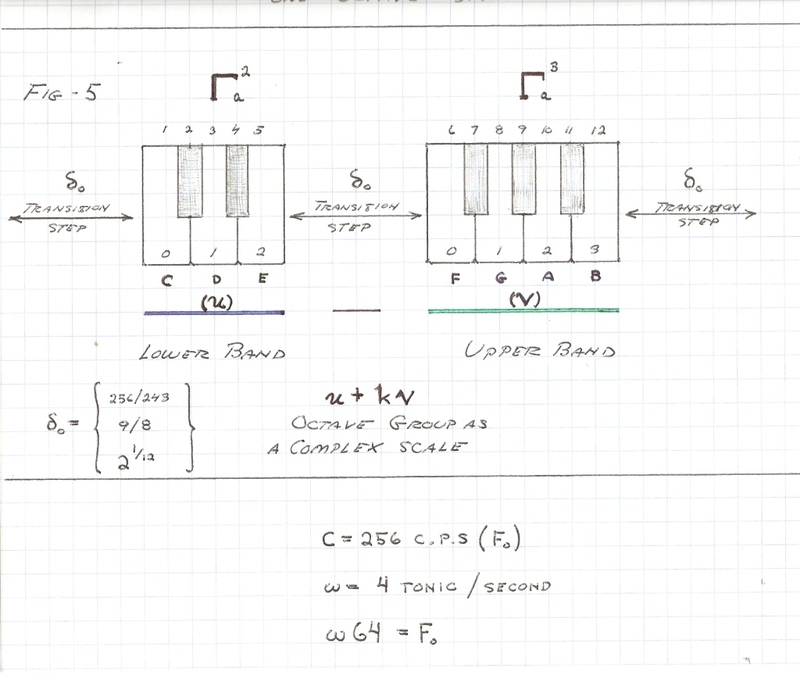 Each fundamental span from the Tonic C to the Octave C, is a single log-periodic cycle called the octave cycles on the standard music keyboard. The entire span of human hearing is about 10 octave cycles. 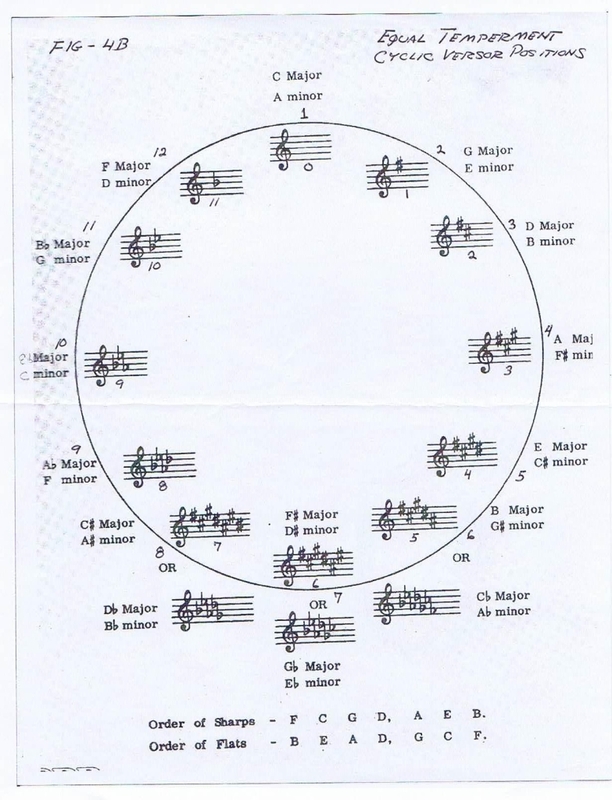 Each cycle, or period, on the music keyboard is divided into 12 subdivisions, that is 12 keys constitute one octave, Fig 2.
each versor system or music scale is a division of 7 keys or unit versor positions, Figs 3 & 4. (4) This symbolic representation by versor operators is of a most complex form. The first complications is that the unit versor positions are not distributed in a uniform fashion, Fig 4C. Neither linear, nor logarithmic, and exist in an uneven connection of sub-versors, Fig 5. Another complication is that a pair of dimensions exist rather than only one. Here exists both the dimension of space as a wavelength, and the dimension of time as a pitch. The product of this pair of dimensions, length and one over Time, is the dimensional relation for velocity, a constant. Hence a velocity versor, and a similar relation to the light-second of Steinmetz. The product of two terms equal to a constant is a hyperbolic function, zero pitch – infinite wavelength, and zero wavelength – infinite pitch. 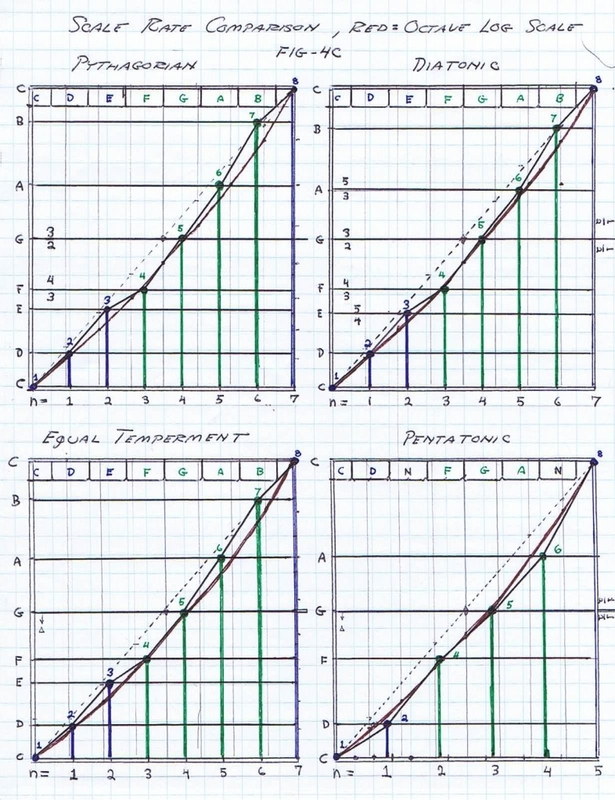 This relation is shown by the logarithmic curve that is characteristic of a rank of organ pipes. And of Arthur Kennelly, Edison General Electric. The symbolic operators of antiquity serve as templates of a hyperbolic versor operator, and hence enter the subject. The hyperbolic versor operator exists in contra-distinction to the circular versor operator. The familiar circular versor operator was employed by Steinmetz but the hyperbolic versor remains an enigma. Steinmetz rejected the hyperbolic versor, but then Pupin rejected Steinmetz’s circular operator, the usual sequence of rejection, ask Oliver. or Nepers per Second, u.
where j is the Steinmetz quadrantal operator. is derived the unit octic (8) versor of the lag in metallic back E.M.F. Here evoked is the idea of Oliver Heaviside that the vector and the versor should not be intertwined. The octic versor is developed in the “Generalized Electric Wave” by E.P. Dollard. The engineering form of the versor operator was born by Steinmetz but was killed at birth, frozen into vector Cartesian form. (10) Polyphase versor operators however continued to develop into a symbolic form known as “symmetrical components”, and related versor operators have come to be called “sequence operators”. This symbolic representation is a natural extension of the Steinmetz “Roots of the Unit” in “Theory and Calculation of A.C. Phenomena”. This also is reduced to Cartesian expressions but is worthy of further study with the objective of developing polyphase versor operators. 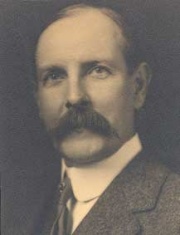 The system of symmetrical components originated in a paper before the American Institute of Electrical Engineers by Charles Fortecuse. This paper was published in the transactions of the A.I.E.E. Volume 37, 1918, page 1027. The title is, “Method of Symmetrical Coordinates Applied to the Solution of Polyphase Networks”. 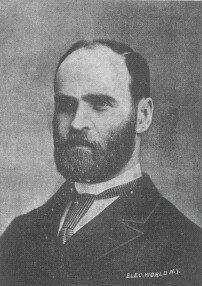 A later article is presented by C.F. Wagner and R.D. Evans in the “Electrical Journal”, April, 1928, page 194, titled, “Symmetrical Components”. This evolved into a book by Wagner with the same title as the article. More will be written on this later. (11) The versor operator is born of mathematical impossibilities. This can be noticed in historical references discussed by A. Macfarlane in his papers. This evokes the often stressed statement by Oliver Heaviside that “mathematics is an experimental science,” it certainly was in the time of antiquity. The quadrantal versor operator employed in the Steinmetz method is derived from a mathematical impossibility, the square root of a negative number. The “Roots of the Unit” give rise to versor operators derived from a meaningless mathematical statement, a base one log system. Moreover the log-periodic operator in its entirety is numerically equal to infinity. It is hereby evident that the generalized symbolic versor operator, the principle objective in this series of writings, will not be born of accepted notions of mathematics. This operator is of a strange world, such as expressed by Lewis Carrol’s “Thru the Looking Glass”. This looking glass is Johannas Kepler (1571-1630) and on the back side is the world of mathematics that preceded him. 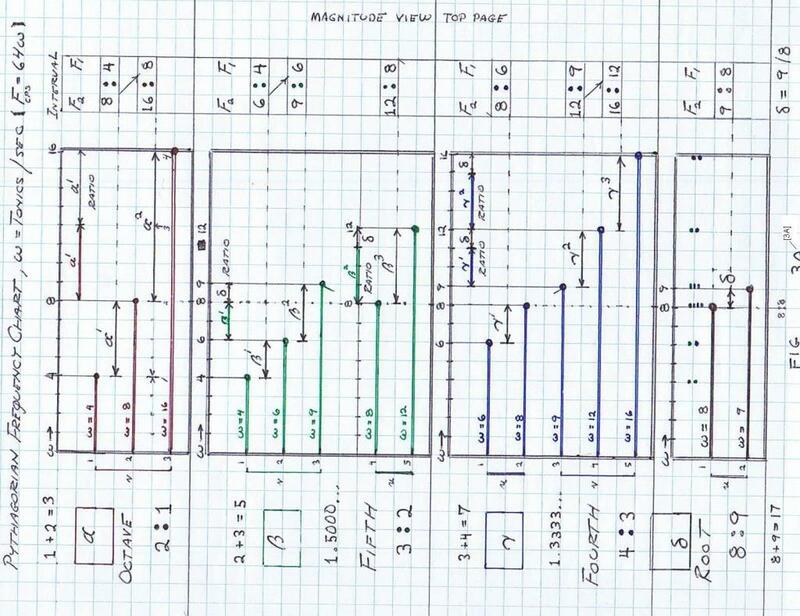 It is a return to the very origin of numbers, mathematics, and the inscrutability of the ideas of Nikola Tesla. This path leads directly back to Pythagoras of Samos. (II) “They were the first to advance this study, and having been brought up on it they thought its priciples were principles of all things”. Here is an expression of a generalized symbolic operator. This concept led to a symbolic operator developed by Robert Fludd (1574 – 1637 AD), it is known as the “Divine Monochord”. (13) The Pythagorean point of view is that numbers are like operators, expressed as (music) ratios (logos), or in pure symbolic forms. Their use for counting is a secondary consideration. 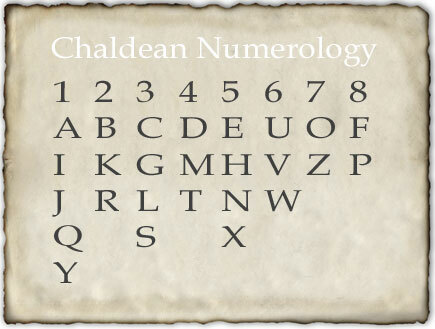 The present era use of numbers bears no resemblance to that of ancient times. Today it is numeration not numerology. On a practical level this is why the ideas of Nikola Tesla are so incomprehensible to the modernistic way of thinking. It is a given in the “Mind of Today” that Tesla was a “little funny in the head”, this in part because of his manner of co-ordinating his lifes movements with numbers divisible by three. His “refugee room” number during his tacit exile was 3327. It is very important to consider that this threedom would not sound at all strange, not in the least, to Johannas Kepler. Entire chapters on the power of the number three were written prior to Kepler’s time. Moreover Nikola Tesla received his education in the classics at Graz, the very location in which Kepler taught geometry centuries before. Here is where Kepler discovered the mathematics of the Solar System. This explains how Nikola Tesla developed his incredible creative power. Tesla gained the ability in his mind to transform directly from the cosmic level to the Earth level from , resulting in a physical manifestation, the working apparatus. His ability to carry out his objectives is derived from the hermetic traditions of Ancient Aegypt, not from pendantic technical training. It can be said that the inability of the modernist to understand Tesla is not because of technical complexity but because of Divine Simplicity. Moreover the modernist has a deep seated pathological contempt for any pre-Kepler concept of a harmonic universe particularly when expressed in a numerological form. This odious animosity for Tesla’s methodology is of such force that even the military and industrial organizations are denied the work of Nikola Tesla. See Vassilatos, “Secrets of Cold War Technology”, introductory chapters. (14) In closing on the subject of the symbolic operators of antiquity is an ancient era equivalent to today’s “Theory of Relativity”. In the universe of human cultures that inhabited this Earth thru the eras of ancient times it was generally considered that the Sun was the center of things, the major heavenly bodies rotated around it. It was considered a heliocentric universe. Great cultures grew upon this understanding. Then it came to pass in the second century A.D. Someone came up with the notion of geocentric relativity. This someone was Ptolemy (90 A.D. – 168 A.D.). His theory of relativity stated that all heavenly bodies now move relative to the Earth as the center, hence geocentric relativity. Geocentricity would poison astronomy for fourteen centuries following its inception. It became a plethora of correction factors, adjustments, and the like, rendering the advance of astronomy impossible. Geocentricity was a pioneering philosophy for the Dark Ages. Geocentric relativity was to become the law of the church with capital punishment. Bruno was burned at the stake for “practicing” heliocentricity and Galileo was exiled for finding that the planets indeed revolved around the Sun. The heliocentric philosophy of Copernicus was banned in this era with the same fervor that the philosophy of Tesla is banned today by the existential modernists. Upon the unification by Kepler of the geometric, heliocentric, and related Pythagorean concepts there could be no more opposition to a heliocentric Solar System of a unit form existing in the generalized heavens. (15) Modern relativity and its autistic child quantum mechanics are historical analogs to the condition of Ptolemy and the institution that followed him. In modernistic relativity it is now that one over c square is the center of the universe with time and space revolving around it. The quagmire of correction factors and systems of distorted co-ordinates developed into a schizophrenic institution known as quantum mysticism. Even beyond geocentricity, this is verily a pathological anthropocentricity, a lemming march into the Kurtzwiel grand singularity of universal annihilation. It is to be made law. 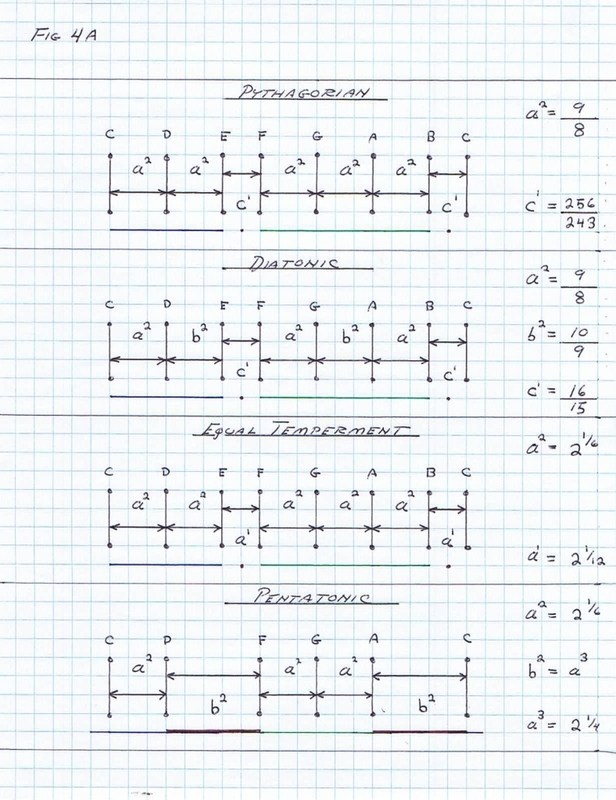 3) “Harmonograph; A Visual Guide to the Mathematics of Music” – Ashton, Wooden Press.